Various small amounts of yarn in the colours of your choosing and the appropriate sized hook. I used Rico Creative Cotton, which is an aran weight and a 4.5mm hook. 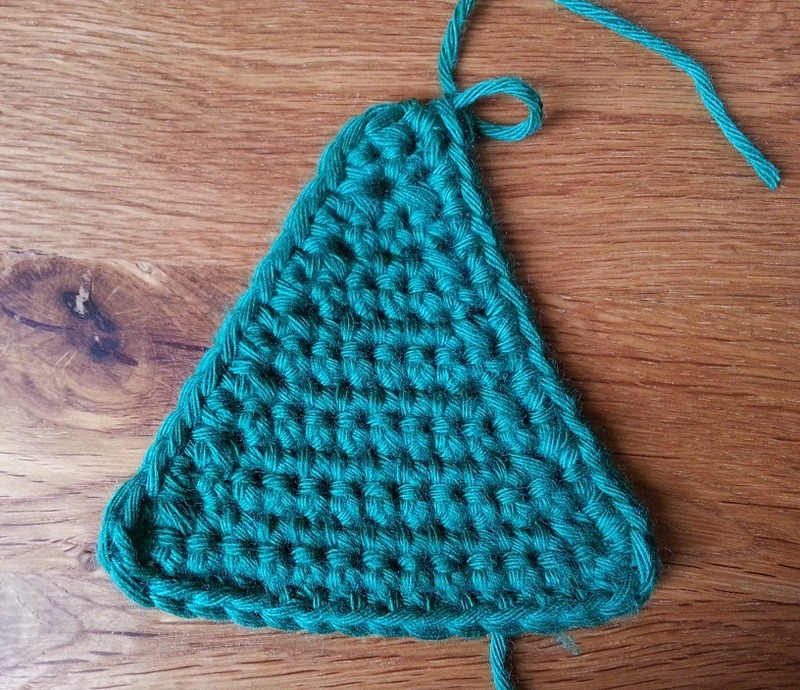 Stitches used are Chain and Double Crochet (DC) (or if you are in the US - SC) and DC Decrease. The DC Decrease (DC Dec) that I have used in this pattern is the simple one; Put your hook in the next stitch, yarn over and pull back through to the front, put hook in next stitch, yarn over and pull back through to the front (3 loops on hook), yarn over and through all 3 loops on your hook. I took some pictures as I went along so hopefully you will be able to follow the pattern if you are a beginner. 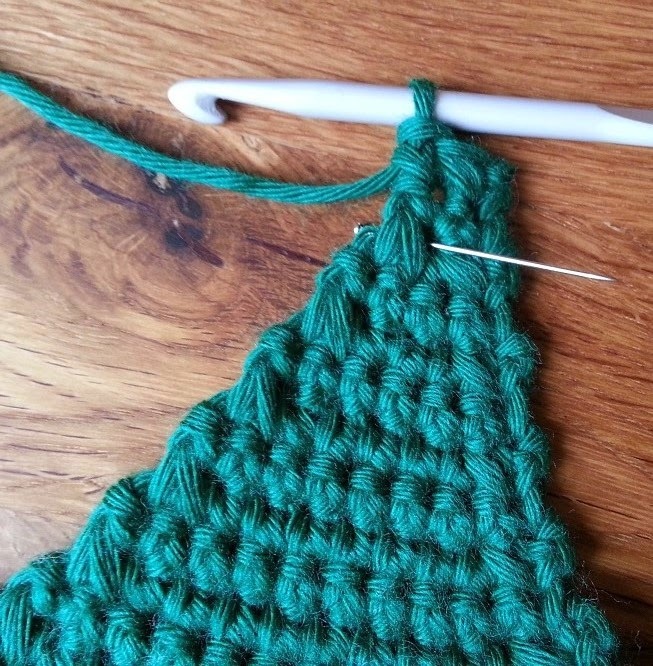 If you have any questions about the pattern please leave me a comment and I will get back to you as soon as I can. Right, to start Chain 15. Row 1 - Starting in the second chain from your hook, 1 DC in each chain along (14 stitches). Chain 1 and turn your work. Row 2 - DC Dec then work 1 DC in each of the next 10 stitches, DC Dec (12 stitches). Chain 1 and turn. Row 3 - 1 DC in each stitch along (12 stitches). Chain 1 and turn. Row 4 - DC Dec, 1 DC in each of the next 8 stitches, DC Dec (10 Stitches). Chain 1 and turn. Row 5 - 1 DC in each stitch along (10 stitches). Chain 1 and turn. Row 6 - DC Dec, 1 DC in each of the next 6 stitches, DC Dec (8 stitches). Chain 1 and turn. Row 7 - 1 DC in each stitch along (8 stitches). Chain 1 and turn. Row 8 - DC Dec, 1 DC in each of the next 4 stitches, DC Dec (6 stitches). Chain 1 and turn. Row 9 - 1 DC in each stitch along (6 stitches). Chain 1 and turn. Row 10 - DC Dec, 1 DC in each of the next 2 stitches, DC Dec (4 stitches). Chain 1 and turn. Row 11 - 1 DC in each stitch along (4 stitches). Chain 1 and turn. Row 12 - DC Dec, DC Dec (2 stitches). Chain 1 and turn. Row 13 - 1 DC in each stitch along (2 stitches). Chain 1 and turn. Row 14 - DC Dec (1 stitch). That bit is very simple so I haven't taken any pictures. 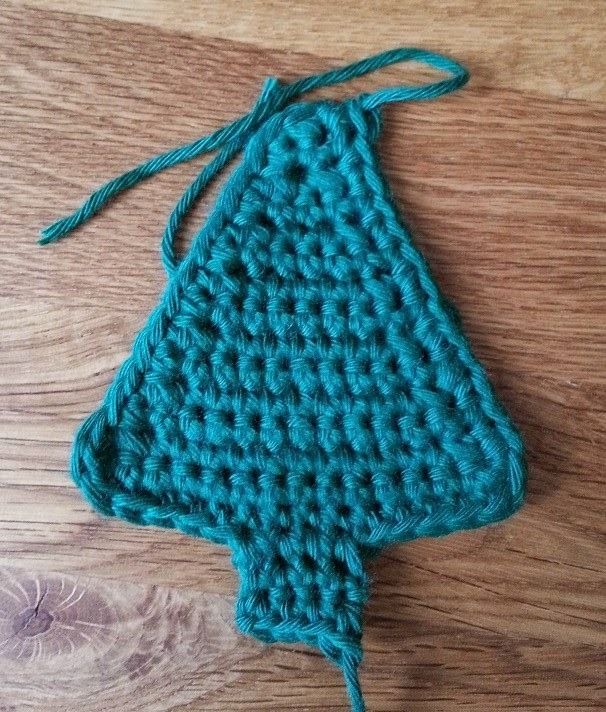 If you want to make the Christmas trees bigger, start with a longer foundation chain, making it an odd number and then crochet an even number of DCs across. 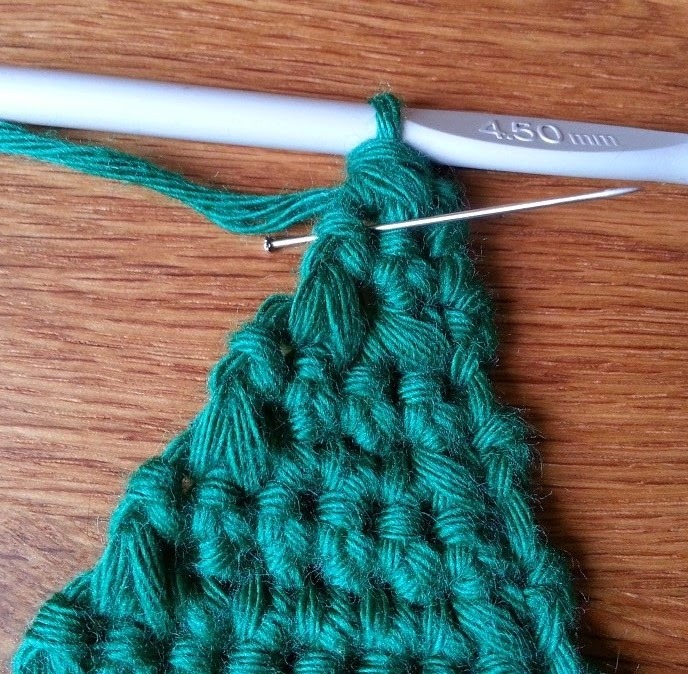 Then do a DC Dec at both ends of every alternate row until you have 1 stitch left. The next part of the pattern is to make an even, neat edging of DC around the tree. Do not fasten off your yarn at this point as we carry straight on from the last stitch made in Row 14. Do not turn your work. Keep working down the edge of the tree,making 1 DC in each row. When you get to the bottom of the tree you should have made 13 DC. 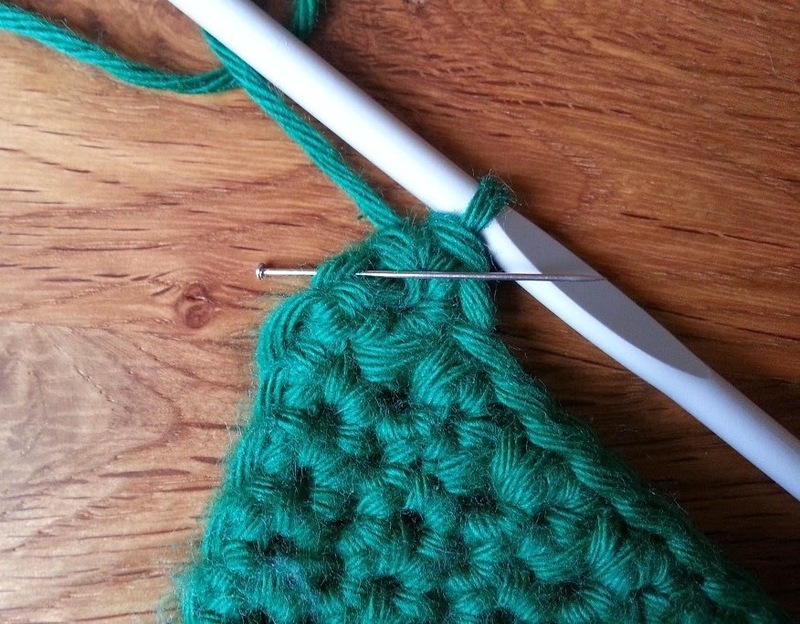 Make another DC in the same space that you made the last DC in (14 stitches made down the first side). Make 1 DC in each of the chain loops (14 stitches). Now 1 DC in each space up that side of the tree (14 stitches made up that side of the tree). That should take you to the top of the tree. 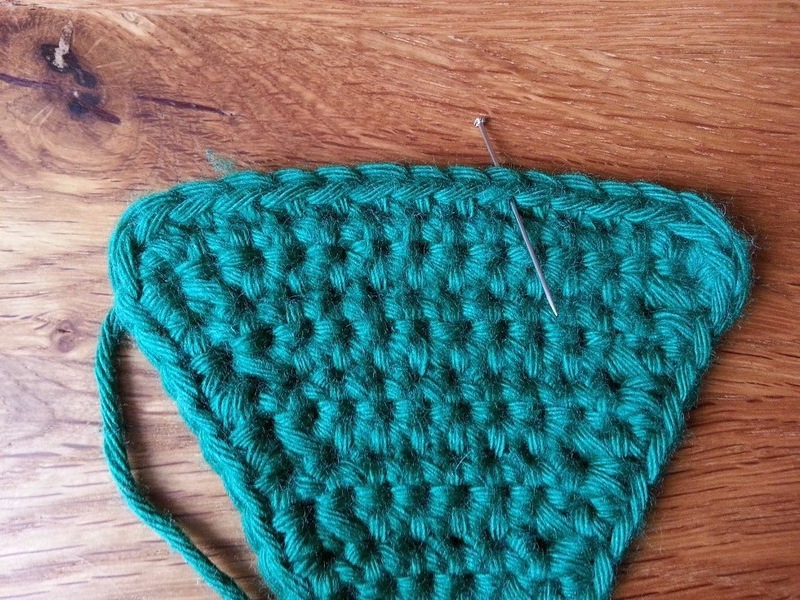 Fasten off the yarn leaving a tail end long enough to sew in later. Now turn the tree upside down, this is so we can make the trunk. 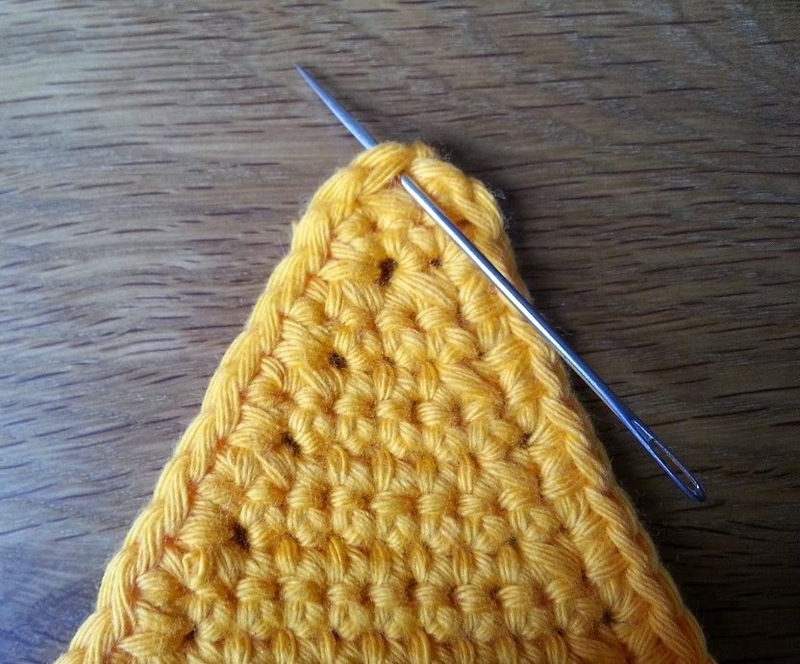 Count 6 stitches along the bottom of the tree and put your hook in that stitch, draw through a loop of yarn and make a chain to secure it. 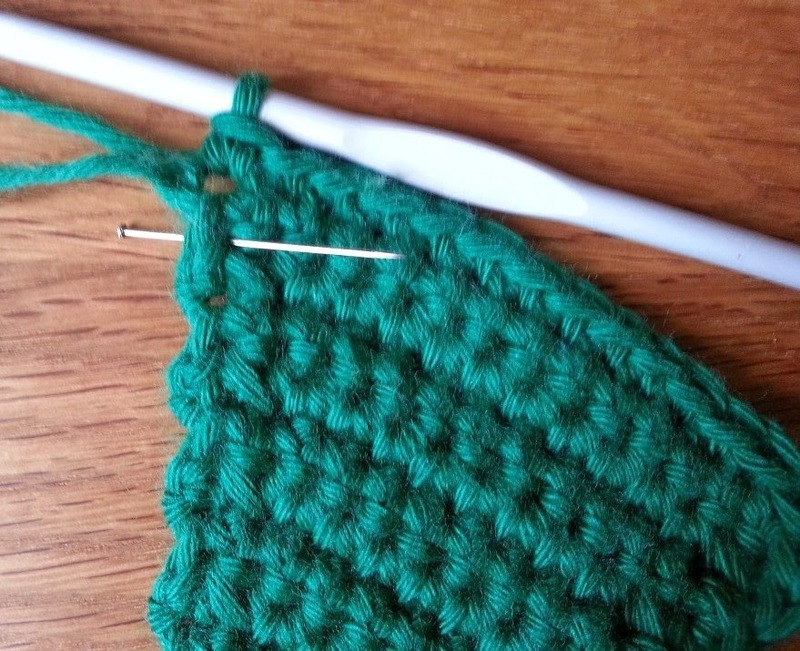 Make 1 DC in the same stitch and then 1 DC in each of the next 3 stitches (4 stitches). 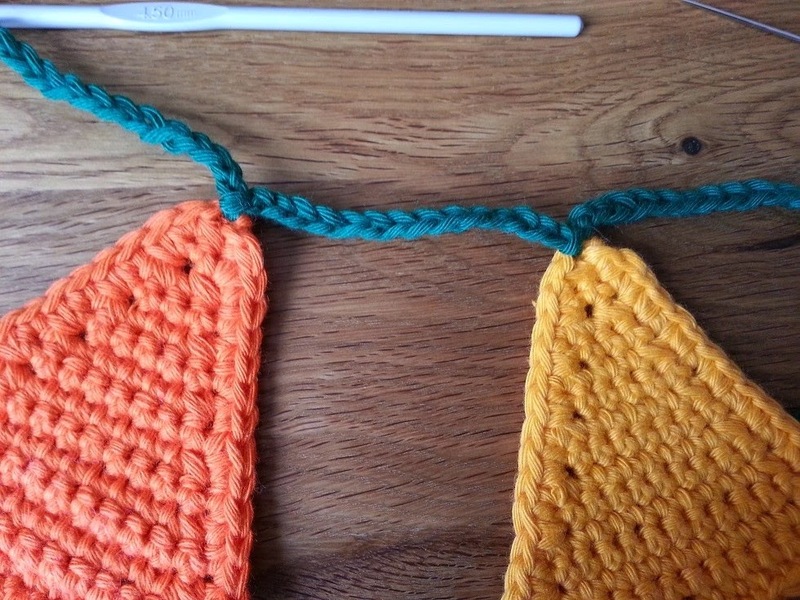 Chain 1 and turn (It is helpful to try to remember to crochet over the tail end here so you don't have to sew it in later). 1 DC in each stitch along (4 stitches) Chain 1 and turn. 1 DC in each stitch along (4 stitches). Fasten off your yarn. Sew in all the tail ends and there you have it, a simple, sweet little Christmas tree. and then chained 14 and slip stitched into the top of the next tree. I carried along like that until they were all attached.